Exotic natural scenery, scintillating underwater worlds and beaches right out of paradise -- all this and much more awaits you on the South Sea Cruise. Strictly speaking, the name South Sea applies to the island world of the South West Pacific Ocean, which includes French Polynesia and the Fiji Islands. The most pleasant time to take a South Sea Cruise is during the winter, between May and October. 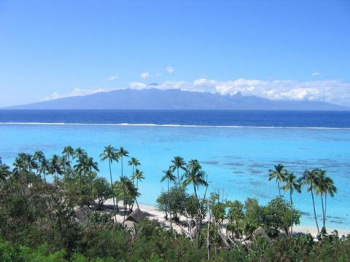 Take a South Sea Cruise and discover the beauties of Tahiti - for example, by touring the island in a 4x4. Or visit the museum in the capital city Papeete and get to know the history of Tahiti. Separated from Tahiti by a 17-kilometre strait, the island of Moorea awaits. What you absolutely must not miss is the unique beauty of the Baye de Cook. However, the waterfalls of Afareaitu and the scenic lookout at Belvédère are also rewarding destinations. The South Sea Cruise then takes you to the volcanic island of Bora Bora. A highlight of this island is the breathtaking Motu Lagoon with its vividly coloured underwater world. This is a place to set racing the pulses of watersports fans and nature lovers alike. You should also make time to visit the main island of Samoa, Upolu. Chill out on the fine sandy beach of Lalomanu or swim right into a waterfall at the Togitogoga Falls. Fiji&apos;s principal island, Viti Levu, with its nature reserve and recreation area Colo-i-Suva Forest Park and main town of Suva, will fascinate you. Here you shouldn&apos;t pass up an opportunity to visit the Fiji Museum.